Pretty and stylish, it will be difficult to choose only one of these travel jewelry cases! Sorry, not sorry. 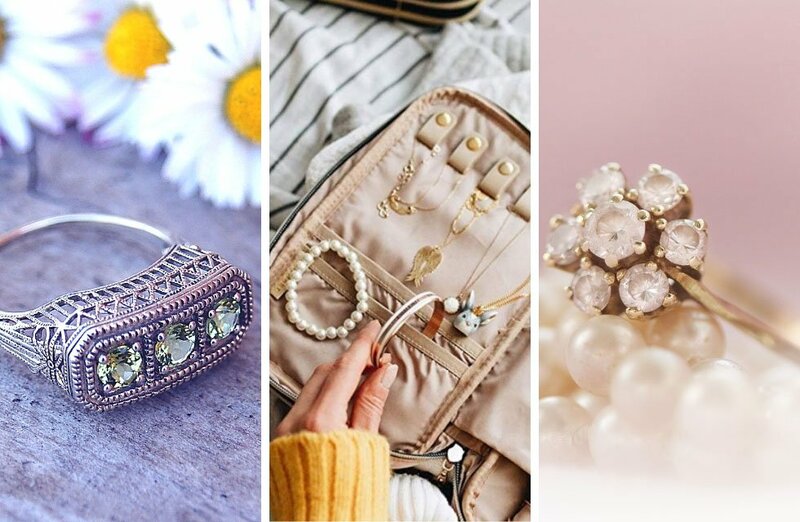 Among handmade, classy, or just simple organizers there are lots of jewelry boxes for women out there, and it can be overwhelming to look for the one that suits you best. Note on handmade stuff: I simply love them! They are just so unique, creative, and often much prettier than industrialized products. Besides, they can often be personalized – initials, name, an inspiring quote, anything! 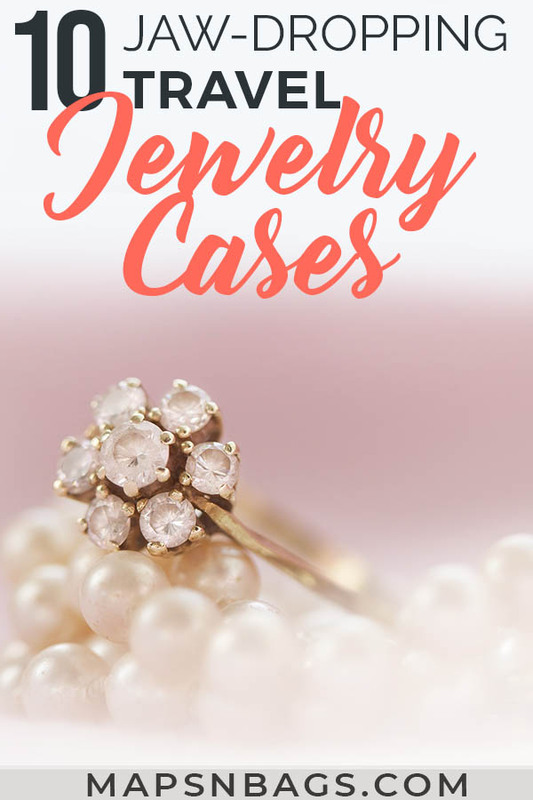 Anyway, I’ve done thorough research on Etsy and Amazon for the best travel jewelry cases available, and I filtered them to this list of ten. None of them are pricey. Relax! But they all have specific characteristics that make them practical and useful. To help you sort this information, I’ve added their features, pros, and cons. However, before we get to it, I’ll explain a little more what travel jewelry cases are (not all my readers know it), why you need them, and I’ll give you some valuable tips on how to take care of your jewelry. Looking for the best travel jewelry case? Read on! What is a travel jewelry case? In this comparison chart, you’ll find the most important information about the cases I’ll mention below. A “travel jewelry case” is a little box, pouch, roll bag or…case (Ta-dah!) where you can arrange your earrings, rings, necklaces, bracelets, and even some more small objects to take with you on vacation. They come in diverse materials, designs, and with different compartments. The best option for you will depend on the number of accessories you have and how you prefer to keep them. For example, many of the jewelry organizers below come with an earring holder, others have zippered pockets, and others just have open compartments. So take a good look at the jewels you have and what features you would need in a travel jewelry case. Why do you need a travel jewelry case? Can you imagine finding all your necklaces tangled when you arrive at your destination? It’ll be a pain to untangle them! Also, I can’t even think of losing the ridiculously pretty blue earrings my mom gave me. It would break my heart (and hers too). Anyway, a travel jewelry case helps you to stay organized during your trips so you won’t damage, tangle or, who knows, lose any piece of jewelry. Also, if you don’t have many items, you might as well use it at home. Under any circumstances put or take your jewelry off near drains. It’s easier to lose them like that than you think. After using pearl necklaces, lay them down, so you don’t stretch the silk thread in it. Like *almost* everything, direct sunlight can damage jewelry. So keep them away from your window. Adopt this routine, so you avoid a snag in a sweater or damaging your jewels with perfume, for example. Before attempting to clean your jewelry with abrasive substances, be sure you know what you’re dealing with. In doubt, just use a soft fabric to clean it. This is a big no! You can lose or break them, or even hurt yourself. Create a routine of getting home and taking them off first. Feminine and simple, this zippered travel jewelry organizer is made of vegan leather. It has four ring rolls, five small compartments, and a pocket for larger items. The light colors, lavender and gray, make it extra feminine. I like that this jewelry box is compact 4.53” x 2.17” (11.5 x 5.5 cm), meaning it is perfect for traveling since it will take little space in your purse. Moreover, the zipper offers extra protection so you won’t lose any item. And, last but not least, you can personalize it with your name, an inspiring quote, or a beautiful sentence. I found this vegan jewelry box on Etsy! Japanese design made in silk. Do I need to say more? I just love this jewelry case! It has two removable pouches: a small case with snap closure for six rings and a zippered case for bracelets. Both of them fit inside the larger case where you can store long necklaces. This larger piece measures 5” x 2.5” (12.7 x 6.35 cm). The vendor claims that this travel jewelry case was made in Hong Kong in the 1970s and it has been in their storage ever since. That sounds super interesting to me, to be honest. I don’t know if that’s true, but they are gorgeous, and they do look Asian, old school. The Japanese pattern is lovely! Unlikely the last two jewelry organizers, this one has necklace holders and two internal zippered pockets. It also has a buttoned ring roll and a panel to attach earrings. This lovely travel jewelry roll is made of cotton and felt. There is a ribbon for closure, and this is the trick here: you can use this ribbon to hang the jewelry roll like a travel toiletries case! That’s brilliant! The roll measures 13” x 8.5” (5.2 x 3.4 cm), and the outer fabric has a map print (isn’t it ideal for travel?! ), which you can personalize with a monogram. This case opens up like a book; hence it’s perfect to carry in your purse. Maybe that’s why I like it so much. It’s a lightly padded jewelry case with many earrings panels, a strip to attach rings, and six necklace holders. Note that this case is designed to protect the pendants with the pockets below. Great feature! Also, I put this picture because this is my favorite pattern, but the vendor has many other colors for you to choose. Oh and it comes in two sizes – large 9” x 6” (23 x 15 cm) and small 7” x 5” (18 x 12.7 cm). The item described in this post is the larger one. – Features: 6 necklace holders with pendant protection, 1 ring strip, earring panel (up to 15 pairs). It looks like a clutch, but it’s a jewelry travel case! This fashionable item has enough room to store all your jewels. No joke. It has two ring rolls, an earrings panel, four zippered pockets (of which 2 are slightly transparent), and four necklace holders. Phew! This foldable jewelry case is practical and fits perfectly in your purse. Besides, it’s lightweight, making it ideal for travel. And although the case has a snap closure, all items seem secure inside. Note that this is the small-sized version of the case. The vendor also sells a hanging travel jewelry case, which is slightly larger than this one. The smaller case measures 9” x 6” (23 x 15 cm) and is made of environmental polyester with quilted cotton. – Features: 2 ring rolls, earrings panel (up to 24 pairs), 2 transparent, small pockets, 2 longer pocket, and 4 necklace holders. Bookworms will have a blast when they see this earring organizer! This fashionable book holds up to six pairs of earrings on each page (It has two pages), so you can store up to twelve pairs in it. 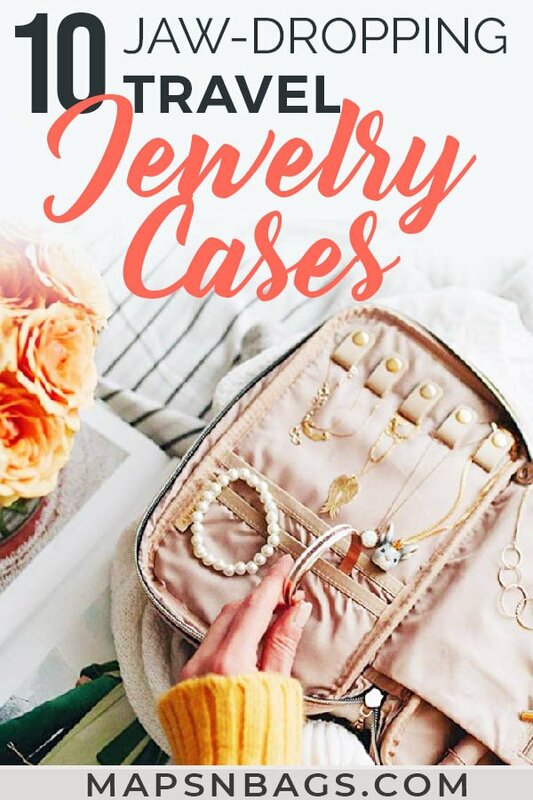 I know this post is about travel jewelry cases, so you’re not expecting to see an only-earring organizer, but many of friends always wear the same necklace and many different earrings. So here you go. It goes without saying that this book fits quite well in your purse measuring only 6” x 4.3” (15 x 11 cm) and is made of faux leather. The cover is pretty sturdy, and the pages are padded to protect your earrings. If you want, you can personalize it with a name, which makes it really unique to give as a gift to someone special (Or yourself! Because you’re worth it. Did you read that with a L’Oreal commercial voice? I did!). Anyway, you can choose among nine cover colors and two sizes, although the description above is only about the smaller one. Pssst: In case you’re wondering, they also sell a book to store necklaces. I’m a bookworm! Needless to say that I’m in love with it, right? This little case is excellent for travel if you don’t have much jewelry and want to keep them safe. It has five ring/ earring rolls, two compartments for necklaces, and a little pouch under the lid. Simple and practical! Made of vegan leather, this round jewelry traveling case is customizable so you can write a name or a sweet message on it. You can choose among beautiful five colors. Note that this case measures 3.4” x 1.5” (8.7 x 3.8 cm). What I like the most about this jewelry travel bag from Case Elegance is that it’s spacious and has many compartments (aka holds up a lot of items). The case has two ring rolls, an earring panel for fifteen pairs, two zippered pockets, six necklace holders, and two bottom pockets to hold the pendants. It’s a large jewelry case, but it’s not huge. Don’t worry. The case measures 9.8” x 6.1” (25 x 15.5 cm), so it looks pretty much like an iPad case. It comes in five classy colors, and it’s slim enough to fit in your purse. This lightweight case organizer is ideal for those women who don’t have much jewelry because this box is small. Personally, I think it’s great for travel, after all, you don’t want to overpack, right? Just so you can have an idea, the box measures 3.9” x 3.9” x 2” (10 x 10 x 5.1 cm). 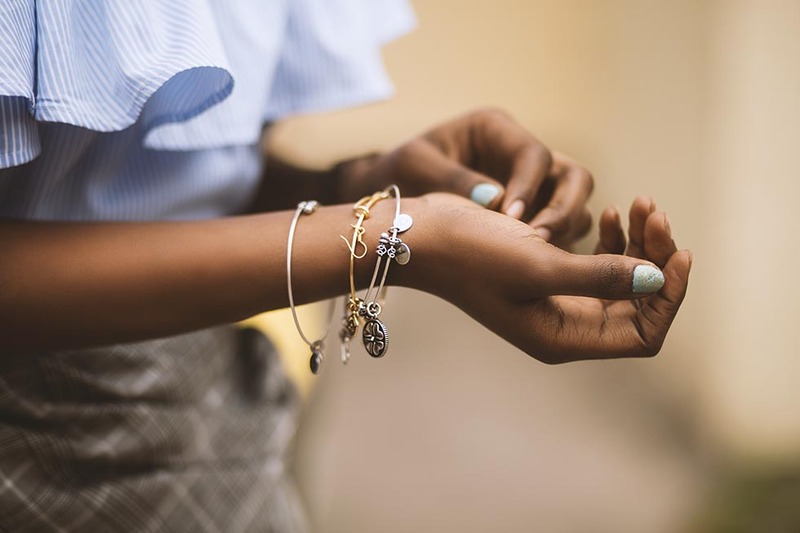 It can keep up to four pairs of earrings, six rings (or more earrings), three necklaces or bracelets and small accessories in the customizable compartment. The design is classy, clean, and pretty. I like it! Chic and pretty, this wooden case is slightly bigger than the last case I mentioned, measuring 4.1” x 3.5” x 3.1” (10.5 x 9 x 7.8 cm). This jewelry box has two levels and to reach the bottom one, you have to remove the tray first. It certainly has a practical design! There are two hooks and a bottom pocket under the lid for small accessories, rings and earrings compartments in the first tray, and a removable divider in the second level. Made of faux leather and faux suede lining, the finishing is gracious with a stud closure and two pearls atop the box. Cute! Personally, I prefer the green version (see the photo), but they also sell it in three shades of blue and light pink. A travel jewelry organizer is an essential part of your packing process, and it helps you to keep your accessories safe and unharmed while on vacation. The size of the case will need depends on the amount of jewelry you have, of course. Also, consider the size of your purse before purchasing it. Do you have any questions re travel jewelry cases? Drop them below, and I’ll be happy to talk to you! This entry was posted in Travel Gears. Bookmark the permalink.